Some newspaper guy called him "The Scrambler," and the name stuck. But ask Fran Tarkenton why he scrambles, and he'll tell you he doesn't ... unless he has to!-and even then it's only about once in thirty plays. 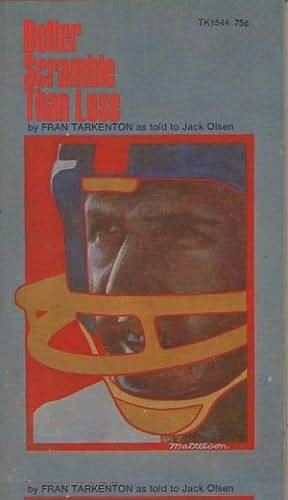 Fran explodes a lot of other myths about himself and about pro football- myths that even some of the smartest coaches swear are true: that pro football players play harder when the money is bigger; that the opposing team usually tries to "get" your star player; that a great quarterback can make any team a winner. Here's the thrilling, true story of one of the game's young "old pros." A minister's son they thought was too soft for the big time until they played on his team!